NB/ Infospectives amateur artistical impression of an award, not a real one. Finalists were revealed back in March and now the die is cast. Winners have been announced and I’m updating this as the news comes out. It’s an excellent range of security resources. So I, in service to the industry I love (absolutely no ulterior motives…none…not a single one), have put in links to all the nominated blogs, podcasts and posts. Just as an aside, this blog may have had one little nomination. See if you can spot Infospectives in there anywhere. Look carefully…it’s easy to miss. No prize this time, but bearing in mind I’m just some random British security pro, who self-authors a largely non-technical blog, the nomination alone was a fantastic and humbling surprise :-). Voting wasn’t open to everyone. It was only for folk who write or podcast about security. Those in with a chance of winning were picked by Ericka Chickowski, George Hulme, Kelly Jackson-Higgins (Dark Reading), Illena Armstrong (SC Magazine), Eleanor Dallaway (InfoSecurity Magazine) and Rich Mogull (Securosis). < no-one with any influence on the global InfoSec stage then! SANS Internet StormCast < WINNER!! WOOHOO – That’s ^ me – how utterly mind-blowing was it to be nominated amongst this run down of security superstars! Everything on Infospectives is my own work, so if you don’t like it there’s only me to blame. If you do, fantastic! Paul Dot Com/Paul’s Security Weekly < WINNER!! We need to talk about attribution – Jack Daniels < WINNER!! 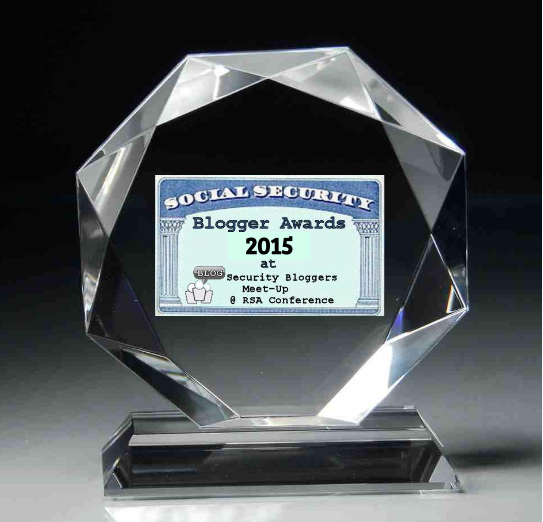 Sophos Naked Security Blog < WINNER!! I wasn’t there unfortunately, but I hear that Security Weekly won best podcast.